Turkish Giant is a Marbled Purple Stripe garlic and that means they can get big and with robust (hot) flavor when eaten raw so they produce a lot of allicin. They're not just hot, they have a deep and earthy flavor with a tinge of muskiness that some garlic lovers treasure. Everything about them is big, even the individual cloves. 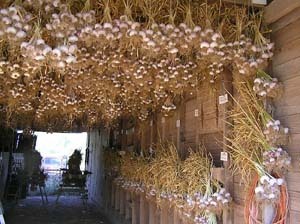 There are only a few cloves per bulb (4 to 6) but they are huge cloves of very flavorful, long-storing garlic. Life is good! Their leaves are big and thick and being a Purple Stripe, they have thick clove covers that are so heavily red/purple striped they can be almost solid red. They're quite impressive to look at and to use. Oh, did I mention, the cloves are HUGE. Turkish Giants are very hardy hardneck garlics and they love plenty of water at the root level, after all, they are literally solar-powered natural water pumps - that's how they get so big. There're not just for northerners, we grow Marbled Purple Stripes here in central Texas so they have a wide range. They can be compared to Metechi ans Bogatyr and are sometimes mistaken for Porcelains but they have much more color and their scapes form a distinct pattern whereas the scapes of Porcelains have no common pattern and are often called serpent garlics. Another big difference is that Marbled Purple Stripes all have long to very long clove cover tips. There's a lot to like about Turkish Giant and they would be a fice addition to any gourmet garlic garden.